Unhappy at work and at home, Amy Sumac (30) now confronts losing her wealthy architect father, the one person she turns to in times of trouble. Reduced to confusion and melancholia, George Baxter (68) no longer recognizes Amy — mistaking her for someone called Mya, a once lovely but reclusive singer of music so unique, her recordings have become nearly mythic, sought-after but rarely found. When Amy discovers drawings of a house George intended for Mya and their clandestine liaisons, her curiosity turns obsessive. His secret life rocks her sense of self, throwing into question her very own identity. David Roy, Writer, Director is a director, writer, visual designer and editor. His new screenplay A PLACE APART is currently in production. In 2003 his feature film MAD SONG was cited as “the most promising directorial debut of the year” by The Los Angeles Times. National Public Radio lauded the film, favorably comparing it to Robert Altman’s early work. In 2004 David helmed one of five individually directed segments of MAN OF THE YEAR starring the late John Ritter. The film played in competition at the Slam Dunk Festival in Park City, as well as the Pasadena Method Festival where it won the “Best Performance” award. In 2005, David received an Emmy for his photographic contribution to THE LUCKY MAN, a documentary about one man’s tragic battle with ALS. David has been a member of the senior faculty at Brooks Institute in Ventura, CA since 2001, teaching writing and directing in the Film and Video Dept. Born and raised in Iowa, David holds BA degrees in History, English and Philosophy from Marycrest College in Davenport, and an MA in cinema from the University of Iowa. His visualization of Heidegger’s “The Clearing” won him first place in the national Refocus Film Festival. After winning numerous local and regional awards for shooting and directing commercials in the Midwest, David moved to Los Angeles in the 1980s, where he employed his multiple skills towards a wide variety of documentaries and commercials, as well as music videos for such artists as Luther Vandross and the Beastie Boys. Theresa Schwartz, Co-writer, Producer holds a BA in Music Education from Truman State University and an MA in School Counseling from Western Illinois University. 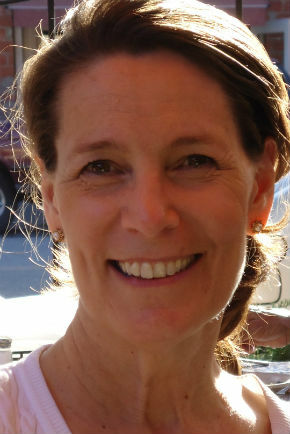 "A Place Apart" is Theresa's debut as a screenwriter and Producer. Prior to moving to California, she worked for the Iowa and Illinois public schools as a School Counselor and Jr. High School Band Director. Theresa is an accomplished clarinet player and teacher, playing for 25 years with the Classique Quintette and various other musical productions in the Iowa/Illinois Quad Cities. She is married to David Roy and has two children and three grandchildren. Ayasylla Ghosn, Producer, 1st Assistant Director is a Lebanese filmmaker based in Los Angeles, California. After obtaining her BFA in Filmmaking from Brooks Institute, Ayasylla started working professionally as a Director, Producer and Assistant Director. She has received 2 directing awards for her films “The Way We Were” and “A Boy’s Best Friend”. Paul F. Ryan, Producer earned a BA in Marketing from Texas A&M University in 1992 and an MA in Cinema/Television from the University of Southern California in 1998. Paul is a producer, director, screenwriter and film editor who has worked in the film industry since the early 1990s. His award-winning independent feature film "Home Room" received a nationwide theatrical release in 2003 and continues to be shown on the Showtime cable network. Paul is also a founder and partner of MOR Entertainment, a film production and financing company located in Manhattan Beach, Calif.
Over the past 10 years, MOR Entertainment has provided production services for Miramax Films, The Weinstein Company, Rogue Pictures, Dimension Films, and Paramount Digital Entertainment as well as for numerous corporate clients including Anheuser-Busch, Pepsi, and Myspace.com. Paul is currently an adjunct faculty member at Brooks Institute and teaches coursework in directing, producing and film editing. Paul has also served as a course lecturer in the film programs at Loyola Marymount University and Chapman University. His advanced project, “Eye of the Storm,” was awarded the Harold Lloyd Scholarship for Film Editing. His thesis film “The List” was awarded First Place Drama at the College Emmy Awards. Karl Ulrich, Director of Photography earned his BA in Writing from Loyola University in 1995 and his MFA in Film Production from the University of Southern California in 2002. Karl began his career as a combat correspondent for the United States Marine Corps before obtaining work on the set of several network television programs and developing a passion for cinematography. While studying cinematography at the University of Southern California, Karl shot several award-wining short films, earning awards from the Director's Guild of America and the Academy of Television Arts and Sciences. Since then, he has pursed his passion by shooting commercials, music videos and documentaries, as well as creating motion-picture marketing materials for 20th Century Fox and other corporate clients. He has also directed two award-winning short films and is currently directing and producing a feature-length documentary on the art of cinematography, with over 30 prominent ASC members participating. AMY SUMAC (35ish) a high school French teacher, dissatisfied at work and at home…struggles to stay in-love with her older, too-protective husband ROGER (40s) while reluctantly succumbing to the charms of a younger colleague MAX (30s)…when suddenly faced with losing her wealthy architect father, the one person she turns to in times of doubt. Reduced to confusion and melancholia, GEORGE BAXTER (70s) no longer recognizes Amy — mistaking her for someone called MYA (20s), a once lovely but reclusive singer of music so unique, her recordings have become nearly mythic, sought-after but rarely found. To further complicate matters, Amy discovers George and Mya were involved somehow, and her curiosity turns obsessive. Dad’s secret life rocks her sense of self, throwing into question their once cherished relationship. Why does he persist in calling her Mya? As she investigates, Amy comes to see beyond the discontent that’s long-paralyzed her and left her dreams to languish. AMY SUMAC (35ish) comely even in glasses. Teaches high school French. Dissatisfied at work and at home. Caring and soulful but lost. Her gift for music long ago abandoned. Living the life her domineering mother deemed appropriate. The unwitting architect of her receding dreams. MAX HARVEY (30) Handsome, charming and witty. Music teacher and great listener. Actually cares for the women he beds. Doesn’t lie to his lovers as much as kid himself. Committed only to having fun yet still attentive husband and doting dad. ROGER SUMAC (40s) Probably enjoys being an insurance adjuster. Likes his martinis and an afternoon on the links. Wants nothing more than to make wife Amy happy, which only deepens her discontent. Obsessed with buying a new house, convinced it will revive their marriage. Earnest in both the best and worst ways. GEORGE BAXTER (70s) Hugely successful architect of shopping malls and bank buildings. Uber rich but secretly unfulfilled. Always done what was expected of him to a fault. Now suffering from dementia. His life a roller coaster of memories and lost dreams. YOUNG GEORGE BAXTER (35ish) Rich and handsome architect. Dutiful husband and proud father. In love with the music of Mya. Inspired to dream big for the first time in his well-managed life. Longs to leave his obligations behind and devote himself to beauty for beauty’s sake. MYA (65ish) Still a raving beauty. The soulfulness of Billie Holiday and the voice of Maria Callas. Had her fifteen minutes of fame but preferred solitude. Mythic status in the world of rare recordings.